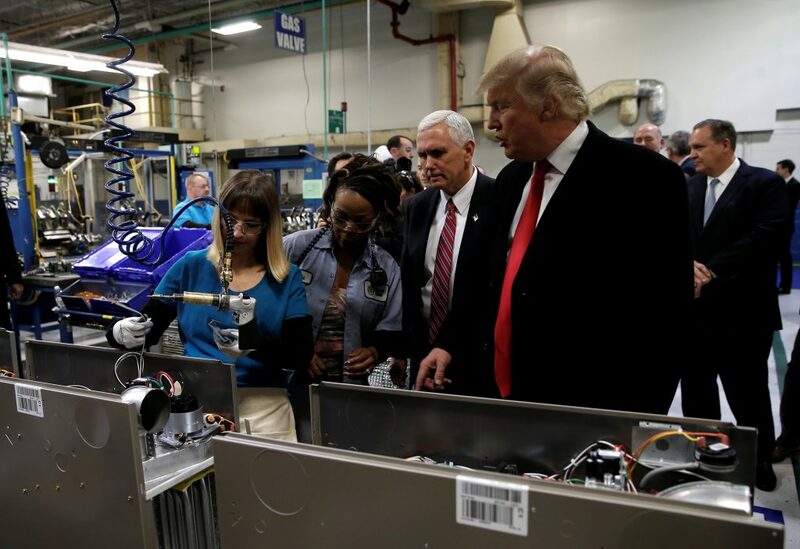 Factory jobs exist, CEOs tell Trump. Skills don’t. Can President Trump bring back manufacturing jobs? Then-President-elect Donald Trump tours a Carrier factory with Vice President-elect Mike Pence on Dec. 1 in Indianapolis, Indiana. Photo by Reuters. Separately, a senior White House official said several U.S. manufacturing CEOs pushed for a contentious proposed tax on imports during their meeting with Trump. The tax, known as a “border adjustment,” would also exclude exports from taxation. House Republican leaders are pushing it as part of a corporate tax reform. The tax has divided the business community. The official says concern was expressed by some of the 24 CEOs in the meeting, particularly those who rely on imported goods. The border-adjusted tax is strongly opposed by large retailers such as Wal-Mart and Target, who argue that they could end up paying more in taxes than they earn in profits. The official was not authorized to discuss a closed-door meeting and spoke on condition of anonymity. 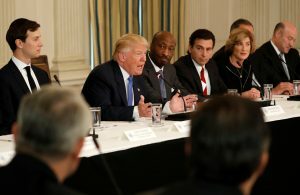 Left: U.S. President Donald Trump speaks Feb. 23 during a meeting with manufacturing CEOs at the White House in Washington, D.C. Flanking Trump are his senior advisor Jared Kushner (L) and Merck CEO Ken Frazier (3rd L). Photo by REUTERS/Kevin Lamarque.